The XE SV Project 8 accelerates from 0-60 mph (0-97 kph) in 3.3 seconds. It's top speed is 200 mph (322 kph). 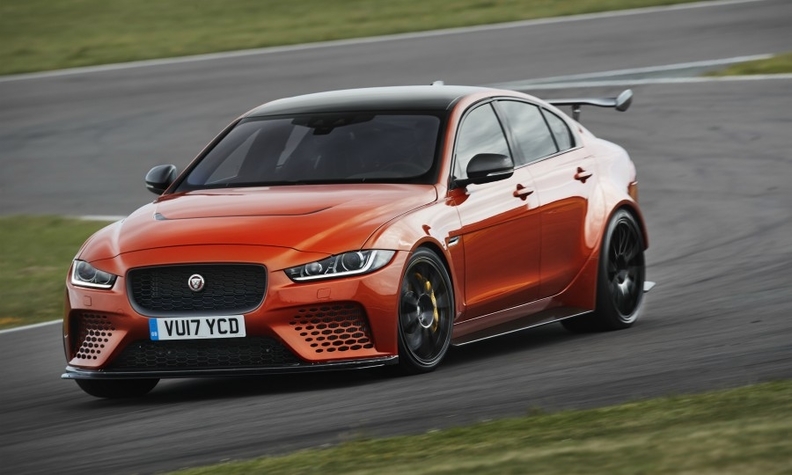 LONDON -- Jaguar plans to build just 300 units of the 592-hp XE SV Project 8, the brand's fastest-accelerating and most powerful road car to date. The extreme version of the XE midsize sedan has been developed to serve as a halo car for the entry-level XE range and as an example of the skills of Jaguar Land Rover's Special Vehicle Operations (SVO) unit. The sedan uses the same aluminum platform as the standard XE, but its hood and bumpers are made from carbon fiber to reduce weight. Power is sent to all four wheels. An active rear differential at the back helps to redistribute power to enhance the car's performance on racetracks.